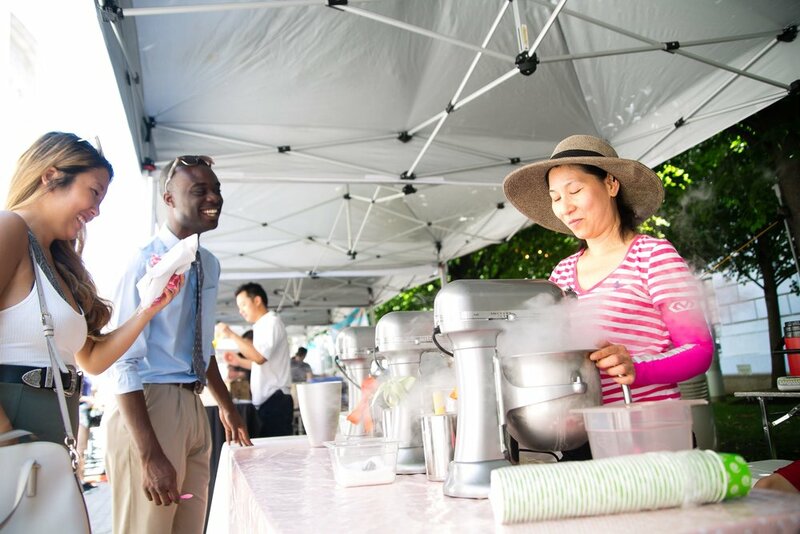 Our weekly farmer's market, Capital Harvest on the Plaza (CHoP) features plenty of farm-fresh edibles and artisanal novelties. The market is intended to be eco-friendly, informative, entertaining, interactive and original. Be sure to stop by our information booth and stock up on recipes and tips for maintaining a healthy and socially responsible lifestyle. 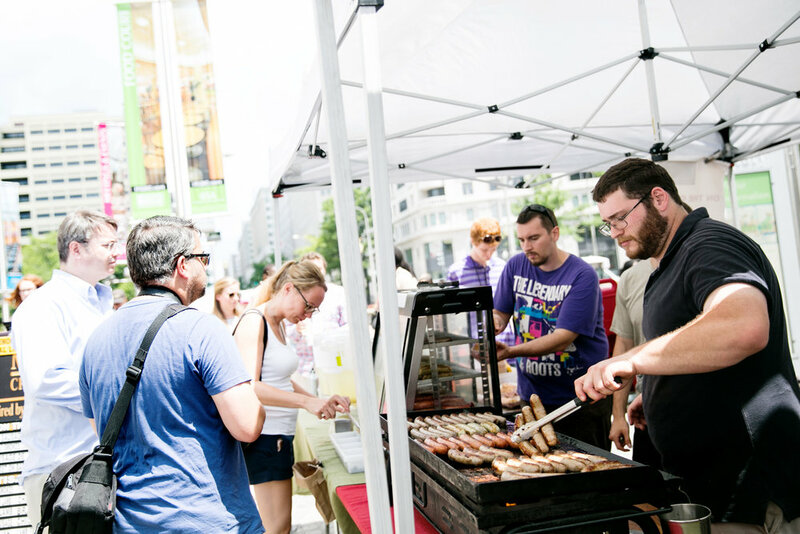 Open Fridays, spring through fall, from May 3 to November 22, 11:00 a.m. - 3:00 p.m. on Woodrow Wilson Plaza at the corner of 13th Street and Pennsylvania Avenue, NW. The market is accessible via metro by either the Federal Triangle (blue/orange/silver lines) or Metro Center (red/blue/orange/silver lines). Parking is available onsite in the Reagan Building's underground parking garage. Full schedule of market below. Authentic and award-winning Venezuelan cuisine with vibrant flavors and friendly service. Its signature offering is of course, the Arepa: thick hearty rounds of grilled maize, stuffed to perfection with marinated meats, cheese, and fresh salsas - with beautiful combinations of tangy, zesty, and savory flavors in every bite. Fresh, local, and hand-made Asian Steamed Buns and Rice Bowls with four different and unique protein options: Koreano (beef), Chancho (pork), PBBJ (peanut butter/banana jam) and Tofu. Serving real Maryland crab cakes since 1971, fan favorites include their veggie-based MD Crab Soup and Crab Bisque. Their massive crab cakes contain less than 1% breadcrumbs, and two different kinds of shrimp – Chesapeake Shrimp Salad (Imperial Style) and Old Bay Shrimp Cocktail. Cipolla Rossa is a wood fired artisanal pizza experience on wheels, proudly serving delicious brick oven Neapolitan style pizza, made by hand using the freshest seasonal ingredients available..
Popping up popcorn for over a decade, Delmarva Popcorn is known for savory and candy glazed popcorn, caramel, and of course, Mark’s Kettle-Korn. They use only regionally sourced popcorn to ensure the best quality of every kernel. Authentic Cajun cuisine from a family of New Orleans natives, Dexter's French Quarters dishes up your favorite crab cakes, gator sausage and hush puppies. Stop by for a taste of the Crescent City. Who dat? Serving delicious meat, shrimp, cheese, and vegetable empanadas all DMV empanadas are made from scratch with locally sourced ingredients. A true artisanal kombucha brewery specializing in nutritious kombucha with extraordinary flavor and nutrition profiles. Kombucha has traditionally been used as a health tonic in Asia and Eastern Europe, and is renowned for its immunity boosting, and detoxifying properties. FishScale creates delicious burgers, with no added breadcrumbs or fillers. Fish is purchased daily, and sourced from sustainable wild fish in accordance with the Monterey Bay Aquarium Seafood Watch Program. Hilana Falafel provides authentic "Jerusalem style" falafel wraps using fresh ingredients and wrapped with love. Delivering fresh, local vegetables straight from the hills of southern Virginia, Larry's offer's the freshest lettuces, herbs, root vegetables, peppers, tomatoes, berries, melons and more. Lovemore Lavender Farm in Owings, Maryland offers fresh lavender, plants, and bath products made from lavender like bath bombs, cream, lotions, body butter and more. Believing in the power of lavender to bring peace and relaxation, owner grower Maria Loveless makes lavender products you’ll fall in love with. Enjoy the taste of baked goods just like Grandma made them - fresh, handmade baked goods include biscuits, muffins, and biscotti that are also available for delivery in the DC Metro area. Swing by Mesisam Ethiopian Eatery for freshly made Ethiopian vegetarian and vegan style dishes. Moroccan Saffron offers the freshest, most aromatic, top quality gourmet products, all made in DC. Their exclusive Salt and Spice Collections offer blends that will inspire your culinary imagination. They are socially-conscious, promote fair trade and sustainable farming practices that support communities, and our ingredients are organically-sourced. "Hand Crafted Slow Smoked BBQ Done Right" - With over a decade of experience, Muggerz offers the authentic BBQ experience using locally sourced ingredients including honey, peaches, and oak and hickory hard woods. Offering all natural and organic nuts, roasted and glazed, nut butters and specialty items, Nuts to You grows their own pecans and sources only through grower co-ops, ensuring you get the freshest product. Offers a variety of different pickles including fire garlic, sweet and spicy, wasabi, Old Bay and black pepper, and kosher dills. These different styles and flavors are sure to knock your socks off. With more than 20 years of experience, Rock Hill’s honey is 100% pure, with nothing added or taken away, and no high-heat or force-filtering techniques used. What you buy is exactly what the bees make. Transform your life through a balanced approach to individual nutrition. A wide range of low-sugar, cold-pressed juices, Senzu has a juice for every lifestyle. Souk is a cozy bakery/market offering globally inspired sweet & savory treats, plus exotic spices & oils. Souk crafts all of their pastries in-house, where chefs and bakers draw daily inspiration from the vast array of spices they sell from around the world! Sample West African smoked meat kabobs and salad bowls. Pick up fresh baked goods like cake pops, cupcakes, cinnamon rolls, cookies, and cakes at Sugar Plug - made with love and brought to market for your indulgence. The FreshMobile serves delicious handcrafted limeade mixed with freshly blended limes, fresh herbs, and fine spices - be sure to check out their top flavor, ginger and mint. Add-ons like cayenne pepper, cinnamon, sea salt and other spice blends are available; or mix in a shot of 100% juiced kale, beets, or carrot. It's a Peruvian family recipe with a new generational twist! The Inside Scoop is the ultimate ice cream parlor on wheels. They serve ultra-premium, natural, hand dipped ice cream made in small batches. They start with organic, grass fed, non-GMO mix and then add all natural ingredients & toppings which are free from artificial sweeteners, colors & corn syrup! The Inside Scoop is family owned & operated. The Salty Lemon is for when life doesn’t hand you lemons! They serve hand-crafted, freshly squeezed lemonade made to order and customized to the way you like it: choose between different sweeteners or add one of their tasty flavors or keep it original. In the mountains of northwest Adams County, PA, about 15 miles northwest of historic Gettysburg, the farm has been in the family for four generations and produces a full line of berries, fruits and vegetables as well as cut flowers. You don’t have to be vegan to enjoy VegHeaven! This a vegan company that focuses on delicious desserts, and yummy food items for everyone to enjoy. This unique bakery specializes in hand stretched Phyllo Dough pastries with different flavors, stuffings, and sauces. Select your fillings from a variety of meat, vegetarian, vegan, and sweet options. See firsthand the delicate process in which they hand stretch pastries table side while continuously tossing the dough in the air. Za'atar is a savory and zesty spice mix that's traditionally eaten as a dip with olive oil and fresh bread. This simple recipe is delicious on its own but its dynamic flavors can be used in a variety of ways: a mix of dried wild thyme, sumac, and toasted sesame seeds gives za’atar it's tasty and unique flavor. Served on flatbreads and with a dip it's complimented by fresh tabbouleh. A small batch coffee roastery located in the Woodridge neighborhood of Washington, DC, Zeke's specializes in organic, fair trade, and sustainable Arabica beans. Featuring single-origin coffees and custom blends. interested in becoming a chop vendor? For vendor application, please click here. For vendor handbook, please click here. View our seasonality chart to find out which fruits and vegetables are in season.